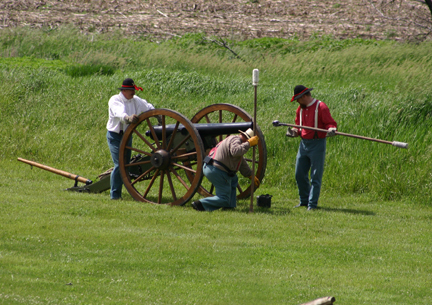 Cobb's Battery is portrayed the the Russell Family of Guthrie Center, Iowa. Over the years many people have joined the unit, but Steve and Mike Russell have been the constant members. Together they have made 4 cannons and a Limber. If you are interested in joining Steve and Mike, write at: 2215 200th Street, Guthrie Center, IA 50115, OR you can contact one of the units officers listed on the 'About Us" page accessed from the homepage of the Army of the Southwest. Cobb's Battery, which was one of the most distinguished and famous of the Confederate Military Units, was organized at the beginning of the war at Mint Springs (now Kuttawa), KY. [Lyon County in Western Kentucky]. Hydan B. Lyons had given up his commission in the US Army and had returned to his home in Eddyville, KY. As timed passed and war was inevitable, Lyons was made captain of the company. Robert L. Cobb was made 1st Lieutenant; with Frank P. Gracey 2nd Lieutenant. The men faced difficulty from the start. Kentucky was a border state and the most divided against itself. Some people were in favor of the North and others in favor of the South. Because of these conditions they could not rain in Eddyville or Mint Springs but had to go to Tennessee to come within the lines of the Confederacy. Accordingly, they moved to Clarksville, TN where as a body they enlisted in the Southern Army and went into training at Camp Boone, six miles from Clarksville on the Guthrie Pike. There they joined up with other Kentucky and Tennessee troops. The Battery trained for Artillery in the 3rd Kentucky Regiment. At this time Captain H. P. Lyon was promoted to General and Lieutenant Cobb to Captain of the Battery. From this time on they were officially known as Cobb's Battery or 1st Kentucky. After training the troops moved to Bowling Green, KY in September 1961. Formally, the Battery was under General John C. Breckenridge. Since Kentucky never officially seceded and joined the Confederacy, the troops became known as the "Orphan Brigade". This troop was commended for their bravery and service and were more distinguished than any other southern troop west of Virginia. Among the famous battles in which the Battery engaged are Shiloh, Baton Rouge, Jackson, Sulphur Trestle, Resaca, Murfreesboro, Jonesboro, Chickamauga, Missionary Ridge, and Johnsville. At Chickamauga the Battery distinguished itself, and at Snodgrass Hill a Marker has been erected by the Governor to show its position during the War. [This marker shows the position of Cobb's Battery in support of the Orphan Brigade assaults on the Federal works near the Kelly Field not at Snodgrass Hill]. When Albert Sidney Johnson fell back with his troops to Corinth, MS, the Battery went with him and began its active service in the great battle of Shiloh. Here the Battery was intended to be held as a reserve under General Breckenridge, but as the attack of the Federals was so sudden and determined, all the reserves were soon rushed into the field and held their places throughout the entire long engagement. Thirty-four members were soon killed or wounded, and every horse in the Battery was killed except one, he belonging to Frank P. Gracey who was in charge of the Battery as R. L. Cobb had been promoted to major [Cobb was promoted to Major and chief of artillery for Breckinridge's Division following the battle of Chickamauga]. After the battle of Jackson, MS, where Cobb's Battery greatly distinguished itself and was largely responsible for the Confederate victory, the troops were drawn up in a hollow square and presented with a banner by the wives of Generals John C. Brekenridge, Boliver Buckner, and H. B. Lyon. The flag was made from dresses of these three ladies as it was not possible to secure material for it from any other source. Shortly after the close of the war this banner, which was carried all through the war and was cut by many bullet shots, was presented to Frank P. Gracey by one of the members of the Battery, who wrapped it around his body under this clothes and smuggled it through enemy lines. It is still in the possession of his son, Julian P. Gracey. 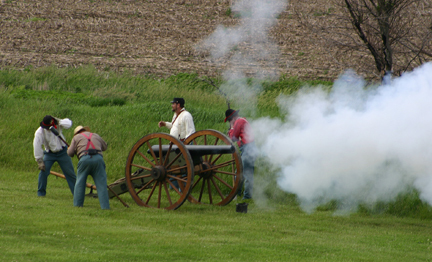 The Artillery batteries of the Orphan Brigade were also armed with a variety of cannons, including M1841 6-pounder smoothbores, M1841 12-pounder howitzers, and M1857 12-pound "Napoleon" guns.